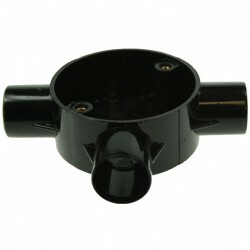 You can find all the necessary Conduit Fittings here at UK Electrical Supplies. We stock varying sizes in black and white PVC. You can also find a range of Conduit Accessories, including, screws nuts and washers. These accessories are available in brass and steel. Norslo and Univolt are just two of the leading industry brands that we stock. With a fantastic discount on all of our quality products, we are confident you will find everything you need. Our support team is available for help with your conduit solutions.